The Southern Fish Trawl Transitioning Working Group has considered the issues surrounding the proposed transition. These are detailed in the public consultation paper (PDF, 578.63 KB) and submissions were sought on aspects of the proposed transitional package. The public consultation period ended 9 April 2018. An assessment of some options relating to the transition were assessed. Download the risk assessment report (PDF, 531.28 KB). 1. What are the current jurisdictional arrangements for trawling? The arrangements for trawling by commercial fishers in waters offshore from NSW depend upon location. Between Barrenjoey Head and the Queensland border, from the coast to the 4000m isobath (approximately 60-80nm offshore). From Barrenjoey Head to the Victorian border, from the coast seaward to 3nm. Ocean Fish Trawl - Northern Zone. Southern Fish Trawl Restricted Fishery (SFTF). The Commonwealth has jurisdiction for trawling outside of the Ocean Trawl Fishery area to the edge of the Australian Fishing Zone and manages this activity as part of the Southern and Eastern Scalefish and Shark Fishery (SESSF). 2. Which NSW fishery is proposed for transitioning into the Commonwealth SESSF? Only the NSW managed SFTF is proposed for transition into the Commonwealth SESSF. 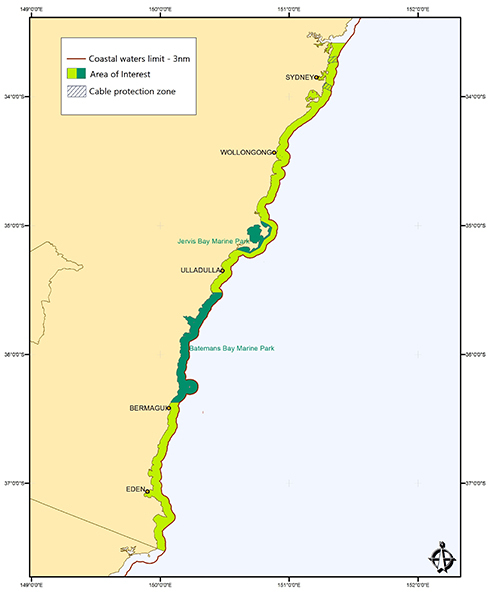 This is the area south of Barrenjoey Head to the Victorian border from the coast (excluding river mouths and bays) seaward to 3nm (JPG, 105.33 KB). 3. Why change jurisdictional arrangements for fish trawling south of Barrenjoey Head? The SFTF has fish stocks in common with the Commonwealth managed SESSF. Many fishers who operate in the SFTF are already also fishing in the SESSF. The new arrangements will mean that fish stocks currently jointly managed in both these fisheries will only be managed by the one jurisdiction, removing duplication and administrative burden for operators currently operating across the two fisheries. 4. How is the proposed transition of the fishery into the SESSF being managed? There will be new Offshore Constitutional Settlement (OCS) arrangements made between the Commonwealth and NSW to enable the transition of the SFTF and relevant species into Commonwealth management. This will be complementary with the current OCS arrangements. Additionally, a Memorandum of Understanding will be developed and agreed between NSW and the Commonwealth that will be used to determine broad principles for fisheries management, such as catch share arrangements. 5. What is the consultation process for the transition and how do stakeholders get involved? A public consultation paper “Transitioning the NSW Southern Fish Trawl Fishery to Commonwealth management" (PDF, 578.63 KB) has been developed to provide further detail about the proposed transition. People can provide submissions on the proposed transition package during the public consultation period that is open from 28 February until 2 April 2018. Additional avenues for consultation will be provided to NSW SFTF Fishing Business owners as they will be directly impacted by transitioning their activities from one jurisdictional regime to another. 6. What is the Southern Fish Trawl Transitioning Working Group, its composition and who is organising it? A working group (the Southern Fish Trawl Transitioning Working Group) meets regularly to ensure that the practicalities of the proposed transition for commercial fishers in the affected fisheries are taken into account. This process is separate to the broader consultation that will be undertaken. 7. How long will be process take? It is intended that the NSW SFTF will be operating under SESSF management on 1 May 2019 when the 2019-20 SESSF season begins. Some processes will be completed prior to this point. However, there are certain processes that can only take place once operators are under Commonwealth jurisdiction, such as the provision of tradable quota Statutory Fishing Rights (SFRs). This will not impact commercial fishing operations as transitioning fishers will be able to continue fishing over the transition period. 8. Will this initiative change the management of NSW inshore prawn trawling or any other NSW fishery? The only NSW fishery that will be impacted is the SFTF. There will be no change to the jurisdictional management of the NSW Ocean Trawl Inshore Prawn Fishery, Ocean Trap and Line Fishery, or any other NSW fishery – they will continue to be managed by DPI. Prawn trawling will still occur south of Barrenjoey Head within 3 nm of the coast. As part of the NSW Business Adjustment Program for commercial fisheries, strengthened management arrangements will be implemented for this fishery. 9. What will the changes mean for commercial NSW SFTF fishers? Under the proposed transition package current NSW SFTF fishing business owners will receive a more secure fishing right in the form of species-based quota SFRs and a permit issued by the Commonwealth. This means that fish trawling south of Barrenjoey Head will no longer be recognised as an activity managed by NSW. There will be streamlined arrangements for fishers in terms of fishing operations and trip limits that were implemented in the 1990s will be removed. 10. What are the new rules likely to be for NSW SFTF fishers? Without pre-empting the outcome of the process, the end model that will be used for transition of the fishery into Commonwealth management will balance environmental, social, economic and regulatory needs. An Individual Transferrable Quota system will be used to manage the commercial harvest of many fish species, and the sustainability of fish stocks will be evaluated under the Commonwealth’s harvest strategy policies. being subject to quota management. Find out more information about the rules in the fishery in the SESSF management arrangements booklet. 11. What is the transition going to cost NSW SFTF fishers? Operators who currently fish in both state and Commonwealth waters will be compliant with the rules in both jurisdictions so there will be no cost to them as a result of the proposed transition package. A small number of operators may need to purchase additional equipment, such as a vessel monitoring system, to comply with Commonwealth rules. However, when fishers have been absorbed into the Commonwealth fishery they will be subject to the same charges and levies as the current SESSF operators. 12. How will catch limits be set in the future? Catch limits in the SESSF are set, and will continue to be set, each season by the Australian Fisheries Management Authority (AFMA) Commission. The catch limits, or Total Allowable Catch (TAC), are allocated across quota holders in the fishery. Quota is able to be traded enabling flexibility while ensuring a cap on catches. 13. What will the changes mean for Commonwealth fishers? There is no expected impact on the operations of Commonwealth fishers or the quota that is allocated to them. While there will be more fishers in the SESSF, the catch that is currently extracted from the Recommended Biological Catch during the TAC setting process for NSW fishers will also be coming across. 14. As a Commonwealth fisher without a current NSW fishing authority, will I also be able to access what is currently NSW waters for this fishery? It is unlikely that Commonwealth operators that do not already have access to the SFTF will be able to access NSW waters as part of the proposed transition package unless they obtain a permit and comply with conditions. 15. What will the changes mean for recreational fishers and the community? This transition moves current NSW SFTF operators from NSW into Commonwealth jurisdiction that already has a strong quota management regime meaning that fish stocks, currently being managed by two agencies under different rules, will be managed by one. This will help to ensure that fish stocks continue to be sustainably managed into the future, and that Australians can consume local, sustainably caught seafood for many more generations. Aboriginal stakeholders will be consulted on any impacts that the proposed transition may have to their communities. 16. If the proposed transition is implemented, will there be larger trawl boats seen from the beach fishing? Current restrictions relating to boat size and trawl methods are likely to remain the same. For example, the proposed transition package restricts boat size to a maximum of 25 metres and there will be no mid-water or pair trawling.